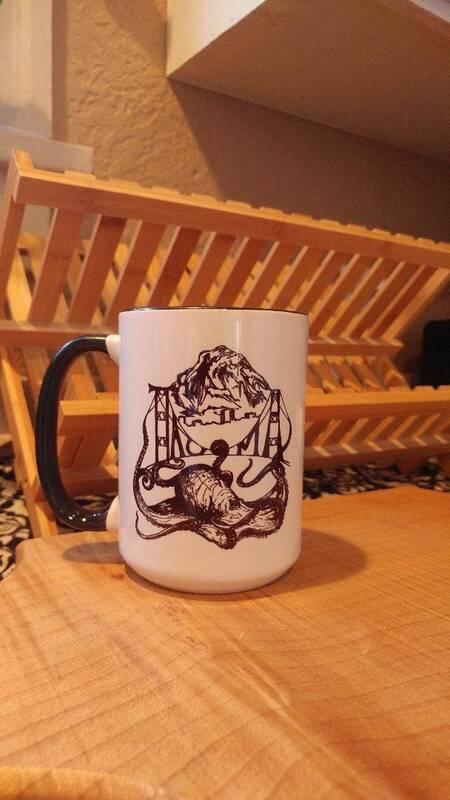 Tacoma Octopus Mug. Our most loved graphic on a fun hot beverage mug. The quintessential Tacoma graphic. Mt rainier, Narrows Bridge and our unsung mascot, the giant Pacific Octopus. 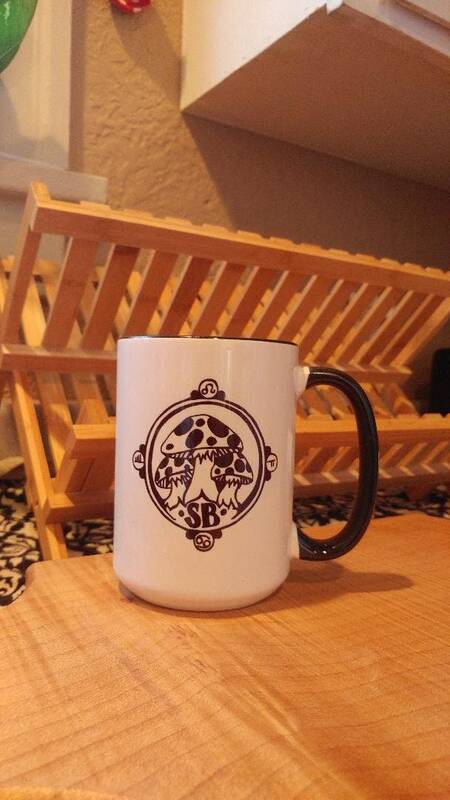 holds 12 ounces of your favorite hot beverage. We love our hot drinks here in the Pac NW! Two toned mug is black inside and on the handle, the graphic is sublimation printed for us through T Town Apperel. Dishwasher safe. Also reps our small logo! Whether at home or at work you can represent your Tacoma Octopus love! Steam wafting up from the coffee or tea as you breathe in the aroma and look upon the beauty that is the Northwest. We understand that original art can be expensive. A big decision at times. Carrie understands this and if you fancy a piece that may be a bit out of price range all at once she is happy to arrange payments. Just contact us and we can discuss arrangements. Unless otherwise stated most items ship within one to three business days via standard shipping unless otherwise requested. Any framed art that is shipped will be insured. If damage occurs in shipping a claim will have to be made. We gladly exchange shirts for size problems and if you are just plain unhappy, ship it back and you will get a full refund upon the receipt of the returned item. Carrie is a skilled artist that loves doing custom work for people. Portraiture of people and animals and even items such as music instruments! Tattoo design, lettering or any idea you may have! Portraiture of loved ones and pets make for great gifts that show heart and thoughtfulness. Prices are affordable!